Gear cable snappage? Small nut, washer and bolt combination to clamp around the stub of cable adjacent to the mech to set the mech on a sprocket/ chainring that makes finishing the ride doable. Tie a bit of innertube across the stanchions of your fork above the wheel. Keeps a bit of the mud off. To clarify, this should be between the fork crown and the arch, not between the stantions. As per the commercial version, pictured here. Neither pretty nor clever, but surely better than getting rid of the frame? My engineer friends weren't that impressed, though. I wouldn't ever drill into an Al frame. A tube is strong because its a tube with out ragged holes near points of stress. 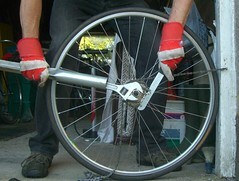 Ever-loosening cranks can be fixed by inserting strips of thickish paper between the bottom bracket axle square faces and the crank. Cut or tear them to the width of the flats and have a slight overlap at the front to stop them slipping back as you push the cranks on. Best done when creaking starts before the crank socket distorts. Just use the lower limit screw and turn it until the mech alignes the chain with the ring/sprocket of choice. 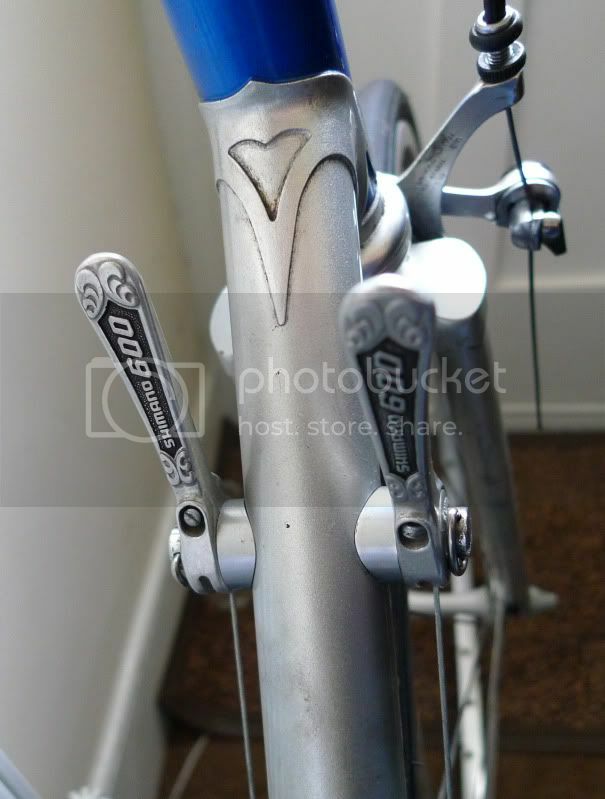 Two picture frame hangers, rivetted to the mudguard with washers both sides, then chopped down mudguard stays bolted on with the usual mudguard eyebolts. It's sturdy enough to hold a brick, so probably just about strong enough for the solidlights. I did that some years ago with a lightweight dynamo lamp, except I used an old mudguard bridge to attach the stays in the conventional manner. I'd seen it on French touring and cummuting machines many times and consider it a very neat way of attaching the lamp. The only problem is that the lamp is in exactly the right place to get all the spray back from the leading edge of the mudguard, and so needs cleaning often. The active ingredients are a long M5 bolt, an expanding wedge bar end, and a 1" to 1 1/8" stem adaptor sleeve. And electrical tape, of course. I did that some years ago with a lightweight dynamo lamp, except I used an old mudguard bridge to attach the stays in the conventional manner. I'd seen it on French touring and cummuting machines many times and consider it a very neat way of attaching the lamp. By "conventional manner" do you mean attaching them at the bottom near the dropouts? I'm sure it's just as good but I had those unused low-rider bosses just begging for the job. The only problem is that the lamp is in exactly the right place to get all the spray back from the leading edge of the mudguard, and so needs cleaning often. I thought that at first but in practice it's not a problem. I suppose if I do a lot of muddy stuff I might change my mind about that! No, I too used the low rider bosses. As a you say - ideal, simple, and quite elegant. By conventional manner I meant that the additional stays attach to a mudguard fitting (a fitting removed from old mudguards, one where the stays attach to the mudguard) in the conventional manner. The mudguard fitting was simply attached to the mudguard by a single bolt through the mudguard, which also served as the fixing bolt for a simple and low profile lamp bracket. I went down the expanding bar end plug route as well, I used it with just a short off cut of piece bar and it is now bolted to an old computer mount, the off set kind that sits the computer over the middle of the stem clamp. My old vista now lives ban in the middle of the bars and leaves room for the back up light. The mudguard fitting was simply attached to the mudguard by a single bolt through the mudguard, which also served as the fixing bolt for a simple and low profile lamp bracket. 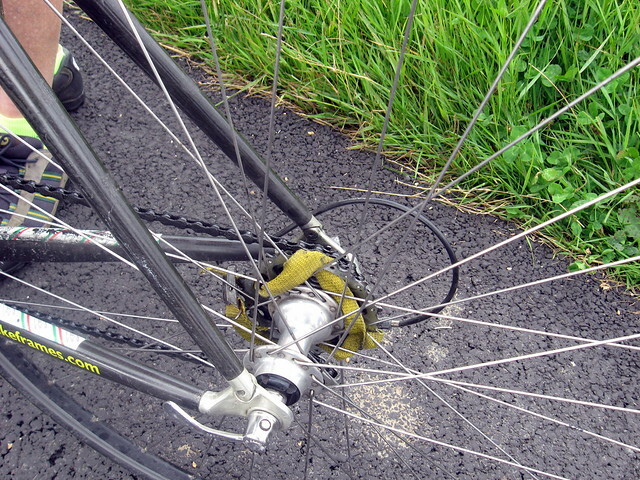 A rather crude bodge, I'm afraid - the rear mudguard on my Brompton broke. For the last year, at least (I forget) it has been held together by a wire coathanger, cunningly wound around the mudguard stays & crimped in place, & some reflective gaffa tape. 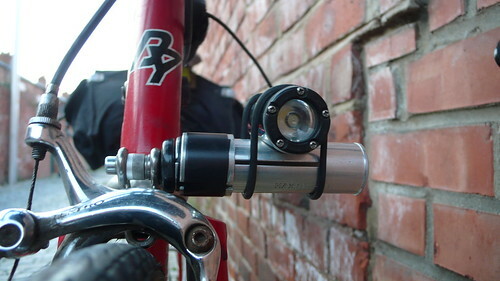 Mrs Bs road bike has a dynamo headlight (brake bolt mounted), fitted with a plug compatible with the battery pack from the good old Smart twin headlights. With a 6W bulb, it's not a bad light. My old Roberts had the same arrangement. The light fitted nicely under my Carradice bar bag, lighting up the road nicely without dazzling me. The Smart lights go on our mountain bikes. A pretty obvious one this; an oil can for hard to reach places. 1x Pump action bottle. The Body Shop lemon foot spray bottle is a handy size. Swap existing diffuser on pump action bottle with diffuser from can GT85. Put oil in pump action bottle*. Use. *Probably a good idea to clean it out first tho' eh? I use a 12" steel rule to measure chain wear, and have previously judged by eye the extra 1/16" at which the chain should be replaced. 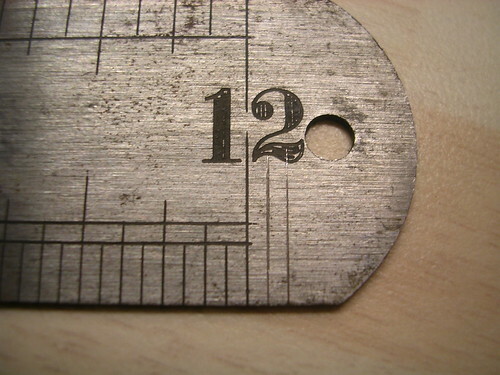 I was considering buying a longer ruler, but I already have more than one steel rule, so made a small modification using the other steel rules and a(n already blunt) stanley knife. I'm surprised it took me so long to think of this (blindingly obvious) solution! The Shimano 600 Arabesque groupset seems to have only been produced with band-on levers. And it's mighty purty. But my bike, though 1980, has some custom features ahead of its time (vertical dropouts; brazed on lever bosses etc). So I took the levers off their band, and used the curved spacer from my ole Shim Light Action levers. The spacers are a bit haphazard, and I have to admit the RH lever does unscrew a bit with use, meaning it won't always hold the tension*, but oldskool riders will be used to giving the latch a tweak now and again. * Yes, of course it's friction! Why would I want to use anything else? The spacing wasn't quite right for mine (the screw wouldn't tighten far enough), so I had to root around for a suitable sprung washer. Had a job removing a casstte lockring the normal way - using a large adjustable spanner and chain whip. The chain whip actually broke. So this was solution number 2, after the chain whip was repaired. Anchor the wheel in corner of garage door with an old chain nailed to the post. Get an extra piece of pipe onto the adjustable and with less strain on the chain whip I was able to put far more power into the right hand with the extension. Worked first time. What a cracker! "If it ain't fixed it's broken"
Whilst on a short Tour of Belgium Mick's freewheel packed up and lost drive so to keep him going I used a cargo strap and threaded it through the inner sprocket to the spokes.